Library Week is over for another year but not before Menai Library's guests lapped up some special treats. Menai Library launched a pre-emptive strike on Library Week 2008 with its library promotions display in Menai Marketplace on Friday May 16. We received a multitude of enquiries throughout the day, ranging from Preschool storytime, Rhymetime, foreign language courses and HSC resources to the location of Menai library and it's history in the area. We met one person who had lived in the area for 30 years and did not know that Menail branch library existed! Historical photographs of the area around the Alfords Point bridge showing the old Lugarno ferry allowed a number of older residents to reminisce about their childhood days. A walkthrough by Bookatoo entertained the younger generation, and those game enough for a cuddle received a balloon. As a result of the contacts made on the day, there has been an influx of new registrations and new faces at Preschool storytime. We celebrated with lots of events including National Simultaneous Storytime, What's Under Wraps and fancy dress fairy storytimes. We raffled a hamper of delights and even offered our visitors morning tea (with marshmallows and bickies!). 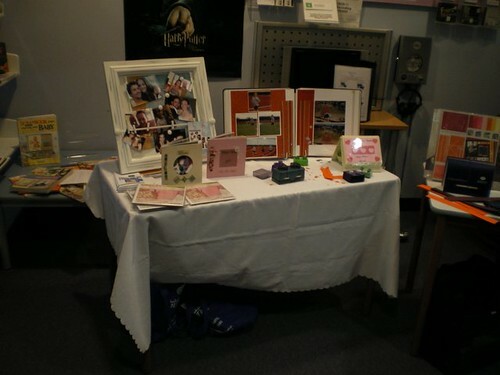 The highlight of our week though was undoubtedly a scrapbooking demonstration by Lisa Mossman from Creative Memories. All participants genuinely welcomed the opportunity to attend the workshop and believed they had gained useful scrapbooking skills by the end of the session. There was a lucky door prize, won by a gentleman who was very surprised to 'win anything at all'. Follow up phone calls provided positive feedback from other interested people. The Library's collection boasts a number of books on Scrapbooking techniques. Check them out for yourself next time you visit. Ask us if you need help locating them - our staff are always willing to help. Scrapbooking enthusiasts might also wish to note our Digital Photography and the Internet course. It could prove to be very useful.